Sometimes you have to leave home to find the things you need. I tested that theory at the end of June, when I took Betsy and Emily on a road trip through Iowa. Today I’m sharing our brief visit with Great-Grandma. My husband’s ninety-eight-year-old grandmother lives by herself in a little house in Fort Madison, Iowa. We arranged to have supper with her on the first day of our road trip. We left Kirksville headed for Fort Madison, and immediately had a fight on our hands. Miss Moneypenny, the GPS lady, did not approve of my route. I wanted to take Highway 63 north and hang a right on Highway 2. She fell in love with a curly-looking county highway in Missouri, and proved her devotion by directing me to turn around and go back to it at every opportunity. If I didn’t need her to guide me through Grandma’s neighborhood, I’d have unplugged her. The battle of wills lasted all the way to Donellson, fourteen miles from our destination, where Miss Moneypenny gave in without admitting I was right. Grandma didn’t come to the door when we rang the bell, nor did she answer our knocks. I tried the door and, finding it unlocked, walked into the living room and called her name. I shooed the girls back out the door. “We’ll wait out here. I don’t want to scare her to death by being in her house when she walks in.” Scare her to death. Poor choice of words. I’m never sure what to do in these situations. After a quick supper at McDonald’s, we sat down in Grandma’s living room for ice cream and conversation. She told a few stories I’d heard before, about growing up on a farm near Argyle, Iowa. Her family survived the Depression because they raised most of their food, and because her parents rented the farm, thus avoiding foreclosure. She also worked for a while cleaning houses in Fort Madison for four dollars per week and contributed the money to the family funds. I remembered that last story from a phone conversation I had with her when I was researching Lottie’s Gift. Early in the story, Lottie’s sister Helen cleans houses to pay her room and board so she can go to school in town. Grandma moved on to talk about her experiences as a telephone operator. She worked for the phone company for thirty-five years, an unusual path for a woman of her generation. But her husband died young, leaving her with a little girl to support, so she had to go to work. We ended our visit after two hours so we could check into our hotel on time. “So soon?” she said sadly, and I felt the weight of guilt on my shoulders. Our visit wasn’t enough, could never be enough. 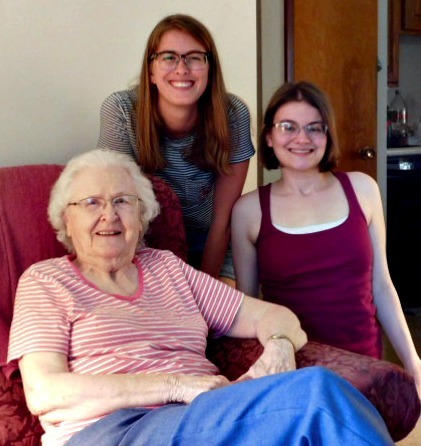 At ninety-eight, Grandma has outlived her siblings and most of her peers. She suffers a kind of loneliness that won’t be fixed this side of Glory. 98? Wow – what a blessing you still have her and she can converse so well. Great story! She is still very functional, Rebecca. She told us that the retirement home down the street kept sending her flowers to try to get her to move, but she wasn’t going anywhere. What a blessing to spend time with her–for you all and for her!